Summer in Savannah means time for free spray pools in some Savannah parks. 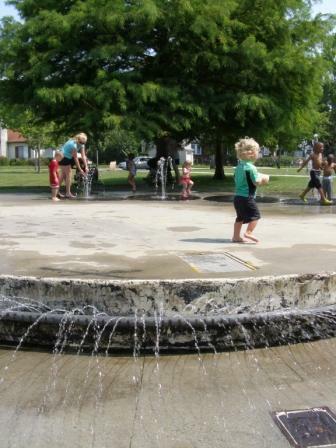 Kids can enjoy a cool water experience at the park under adult supervision. Locations include: Avondale, Hull Park, Forrest Hills, Forsyth Park Paulsen, 38th Street Park, Savannah Gardens, and Victory Heights Parks. Hull Park (55th Street & Atlantic Avenue in Ardsley Park) spray pool Saturday hours: 10AM-3PM; Monday-Friday 10AM-3PM. Often this spray pool may on at other times, too. Ellis Square @ Barnard and West Congress streets next to City Market in downtown Savannah also has an interactive fountain where kids can play in the water (Ellis Square also has restrooms & a variety of seating options) No set hours for when the fountain is on and there’s no city-provided adult supervision like there is at the fountains listed above. FOR MORE SAVANNAH KIDS’ SUMMER ACTIVITIES, CLICK HERE. This entry was posted on Saturday, May 5th, 2018 at 12:04 pm	and is filed under FREE Spring 2019 Savannah kids events, Mommy & Me, Pre pre-schooler activities, Summer Fun 2018. You can follow any responses to this entry through the RSS 2.0 feed. Both comments and pings are currently closed.